I want to show the progression I have done with my DronePilot framework, and in this video I'm showing how to do a trajectory controller. In this part we are focused on the Guidance (using the GNC argo). This refers to the determination of the desired path of travel (the “trajectory”) from the vehicle’s current location to a designated the target, as well as desired changes in velocity, rotation and acceleration for following that path. 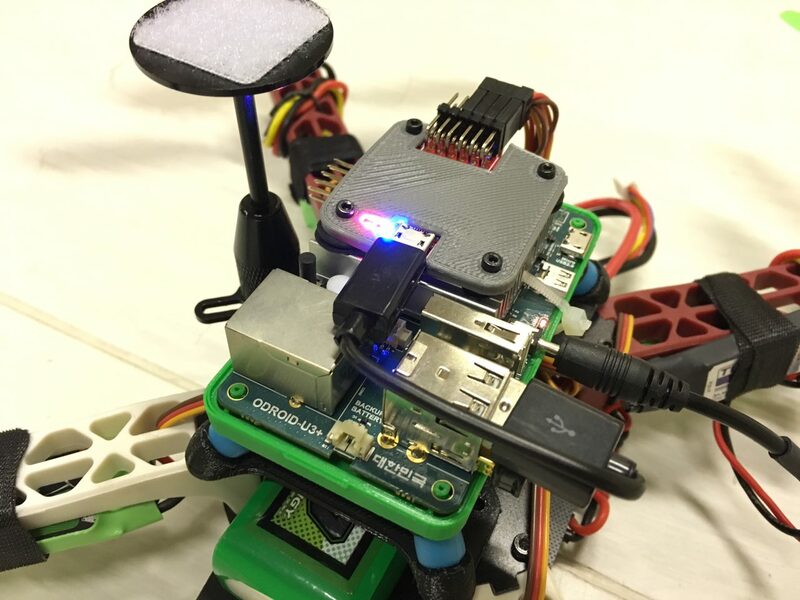 For the first part, in this blog we will use Altax Flight Stack, that compromises a companion computer and a flight controller. In this particular case I’m using a naze32 as flight controller, and two companion computers: Raspberry Pi 2 and Odroid U3. The naze32 is connected to the Odroid U3 via a usb cable (a very short one). The vehicle is a 330mm rotor to rotor fiber glass frame, with 7×3.8in propellers, 1130kv motors, 15amps ESCs and a 3000mah 10C battery. It will fly for 11-13 minutes. The Odroid U3 is running Ubuntu 14.04.1 in a eMMC module, which makes it boot and run generally faster. Its being powered by a BEC that is connected to the main battery. We need to generate certain X and Y coordinates that then it will be “fed” to the position controller at a specific time. We are going to create two types of trajectories, circle and a infinity symbol. Why this ones? 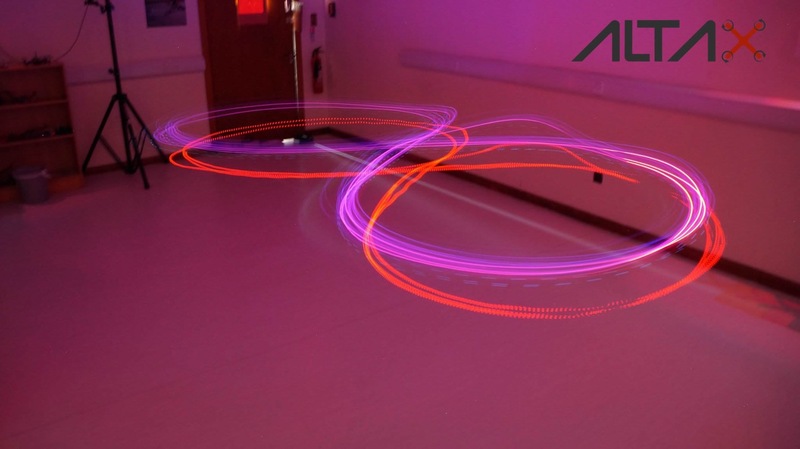 because this ones are easy to generate and perfect to excite all the multi-rotor modes. So, if we declare “w” like this: (2*pi)/12 it means that the trajectory will take 12 seconds to complete a full revolution, and then start over. This is the parameter that we will change if we want the vehicle to travel faster. Its better to start with a slow value, and then progress to faster trajectories. The next step is to “fed” this coordinates to the position controller inside the control loop. That is done in this script. The one I like the red dot one! why is this?? that one is called the Lemniscate of Bernoulli, which is constructed as a plane curve defined from two given points F1 and F2, known as foci, at distance 2a from each other as the locus of points P so that PF1·PF2 = a2. And then the rest is feeding that information to the position controller which will try to follow that trajectory as the dots on the plots. Magic. The next gif is a replay of the flight (DronePilot logs data for further analysis...). The trajectory above is the fastest my vehicle can do (without getting unstable and or very shaky), it can complete a figure of eight in 6 seconds... does anyone know a human pilot that can do this?? I don't think so. hahaha. The picture above is a long exposure of the vehicle doing the figure of eight trajectory. Will read ur blog further but do you use external position feedback? If not cgtz! I like the theme of combining a microcontroller FC for the sensors with the RPi companion. As a cheaper and smaller high performance option than pixhawk I like the look of the Openpilot revolution FWIW. Hi, it is great thing! would you like list the all detail components of yout flying test platform? i also want to build the same one for experiment. that's exactly was I was seaching for, please update us regarding pixhawk implemetation. So now you are planning to do it with Arducopter platform using a serial port in the FC? Are you planning to speak with pixhawk with mavlink ?? @aldo have you posted your question on http://discuss.ardupilot.org?